Hints for uses in your library Squishy Circuits are an engaging way to explore how circuits work -- while encouraging creativity! Before facilitating this activity, practice making your own circuits and/or use the online circuit simulations at https://phet.colorado.edu/en/simulations/category/physics/electricity-magnets-and-circuits. I used this program for a group of 4-7 year olds and their adults. They had great fun and learned alot! It is easy to use, does take time to make enough dough for a large group but it is worth it. Our library had used Squishy Circuits for an event for kids in grades K-6. We had about 18 kids attend and the parents stayed to help as necessary. I had purchased the old generation kit for $25, plus five extra battery packs for $5 each from the Squishy Circuits web page. I purchased 50 additional 10mm LED bulbs from Amazon for about $8.00. The items I purchased can be used for additional programs and I felt they were worth the investment. I made my own conductive and insulating dough, doubling the recipe for each. These supplies were adequate for 18 kids to work in six groups of three. We first discussed open and closed circuits and used a toy called an Energy Stick (less than $10 online) to demonstrate this by holding hands in a circle, then completing the circuit with the Energy Stick, which would make sounds and light up. We then had the groups create a circuit using the conductive dough and a single light bulb, reviewing open and closed circuits. Then we had them smush the dough together to create a short circuit. Next, we introduced the insulating dough to show that instead of having a gap in the dough to complete the circuit without shorting, you could stick some insulating dough in the middle. This first activity took about 10 minutes. After that, we showed the difference between parallel and series circuits, though they had already figured out parallel on their own by adding as many bulbs that would fit to their original circuit. This activity took another 10 minutes or so. With this basic knowledge, we then introduced the design challenge for the kids to build creature with eyes that light up. We allowed the kids about 20 minutes to work on their designs as a group, though we had plenty of dough and lights that the kids could work independently if they wanted. They just had to share battery packs to test their circuits. We had a few buzzers and motors from the original kit, so we let the kids incorporate them into their designs. We did not have enough for every group to have every device, but they did well taking turns. The alarms were especially annoying and one younger child was upset from the noise, so I probably wouldn’t use the noise makers again for this age group (K-6). After the program, I let the kids keep their playdough, since the conductive and insulating dough were pretty mixed together. We collected all the bulbs, buzzers, and battery packs. Every piece of metal that was stuck into the dough needed to be cleaned; the salt dough is very corrosive if not cleaned off. Also remember to remove the batteries from the battery packs for storage. Overall, this event gave the kids a basic lesson in electrical circuits and presented them with a design challenge that required them to use their newly learned knowledge. Because of our modest budget, the kids also had to demonstrate teamwork and share resources. Plus, it was a lot of fun! We had entirely too much fun with Squishy Circuits! We opted to purchase the various electronic components directly from the Squishy Circuits people back when they were still just a project of the University of St. Thomas’ Playful Learning Lab, but our kit sort of fell through the cracks. (In our defense: it’s small.) We pulled it off of the shelf where it had been languishing, however, and we’re so glad we did! As a note, you can purchase the various electronic components from a hardware store, but we did a price comparison and the value was roughly equal to purchasing them from the Squishy Circuits store. If you put the kit together yourself you won’t receive technical support or replacement/return assistance from the Squishy Circuits people, who are really quite helpful. It’s a trade-off. Our kit has the basic “Standard Kit – Prior Generation” components. The box included recipes but no pre-mixed dough, no color-changing LEDs, and fewer LEDs overall than the newer kits. We found that the standard kit and one standard recipe batch each of conductive and insulating doughs was perfect for a group of around five kids. Once more kids arrived, we had to start running the Squishy Circuits activity in shifts—which is not an insurmountable challenge, as we had other Makerspace stations going simultaneously that we could send them to work with. 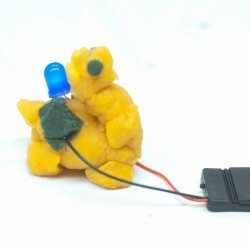 Just be aware that the battery pack will be in high demand—also, it has some fragile elements which will see a great deal of wear—and that there aren’t enough LEDs for more than five kids to complete even a basic circuit challenge at a time unless you (a) purchase or (b) put together multiple sets. Mix extra dough! By which I mean: mix at least five batches for a group of 15 kids. The insulating dough is in less demand than the conductive. I highly recommend taking a good long look at the Squishy Circuits website before you mix your doughs, and watching the step-by-step videos. I mixed my first batch out of order, being the compulsive person that I am, and it turned out gritty and dry. Dry playdough is … not great for small hands and worse still if you want to use the dough multiple times at multiple events. The Squishy Circuits website also includes some projects of varying degrees of difficulty that are useful to print out and try, in addition to the activities linked from this activity sheet. Most if not all of them require adult assistance, however, as they include only a couple of pictures and diagrams and rely on text for detailed explanations. The main gist of each project is that the conductive pieces of dough must be COMPLETELY separated by insulating dough for the circuit to work properly! And believe me, if the circuit doesn’t work properly, you WILL be required to provide assistance to the kiddos, who know exactly what they want. Which is for light bulbs to shine and buzzers to buzz. Loudly. Oh, yes, and the buzzer included in the standard Squishy Circuits kit sounds a lot like a smoke alarm, so be aware that you might have some curious people sticking their heads in and out to find out what’s going on. Free marketing OR a free visit from your concerned neighbors? You be the judge! In summary: buy more LEDs. Buy more battery packs and wires. Mix WAY more dough than you think you will need. And then you’ll be set! This activity served as a great draw for our Makerspace program, especially for parents of kiddos in the preschool to kindergarten range. We advertised on Facebook and ended up with double the number of kids as usual, many of them first-timers. You may not want to run this program (i.e. mix dough) every week, but for banner events and special occasions, it’s perfect.